Xilinx, Zombies, Schoolyard, and Feedback…oh my! Sorry we missed a week in updating, things got a little busy! But, we’re back now, and this update will be all the richer for covering 4 races. Hope you enjoy it and thanks for reading! The final weekend in October saw us visiting Xilinx, a frequent host on the local cx scene. This venue tends towards less technical power courses, with lots of bumpy ‘native grass’ sections, but has plenty of parking and a variety of terrain so makes for great races overall. This particular day had multiple sections of damp earth that were completely power sucking. Carl felt like he lost about 5mph every time he rode into those…unfortunately the rest of the field didn’t seem to have that same dynamic! Kristal’s field went off early, with a sizeable group for the Women’s Open. She rode a solid race, with plenty of back and forth in the group and eventually rolled in 9th place. Carl’s field was large as well at >50 riders! As mentioned, he struggled in the power sections, losing lots of places in the final 2 laps to come over the line in 38th place. Errin’s field was good sized too, with an encouraging 30 women lining up! After lots of life and work stress and with stitches still in her knee, she rode a conservative and solid race to finish in 10th place. I finally got to take advantage of my second year racing and ride a course I was familiar with this weekend. Xilinx is where I had my first race ever last season, and the course was basically unchanged. While previewing, the two areas I found really difficult last year were much easier this time. Hopefully that means I've learned a thing or two since I started racing cross! Big field in my category, and I ended up starting in the fifth row. I was feeling very good after my warm up, and I moved up into the top 25 or so by the time we left the asphalt. I had one minor mechanical, dropping my chain on a bad shift on the second lap. I lost five or six spots while getting back on the bike, but I got them all back before the fourth lap. Each lap was faster than the one before, which is the first time I've ever pulled that off. This was by far the best I've felt for an entire race. It was the first time where not only did I feel confident enough to try and chase down and pass riders every lap, but I was strong enough to actually pull it off. I finished well into the top half of the field, and ahead of a few riders who I'm usually way behind. Sunday’s race was Zombiecross, held at the Equestrian Park in Parker. This course always offers lots of twisty turns, some sand and short, steep climbs and descents. Carl and Kristal were both feeling a little blown from their efforts of the previous day. Kristal was able to shake it off well, while Carl just had deep fatigue that wouldn’t go away. Rob also joined us this day in the 45+ Open field. Kristal excelled on the technical course, riding solidly and making steady progress after a bit of a slow start to nail down 5th place. Carl and Rob faced a stacked field. Carl started well and battled, but never got his legs opened up and drifted slowly back throughout the race to come in 24th place. Rob rode to a solid 33rd position, especially considering this is not at all his type of course and the challenges he faced! The Zombie Cross event two weeks ago in Parker did provide some Halloween frights for me when a course stake impaled my front wheel, wedging itself between the spokes and fork, resulting in a wrestling match with the stake, which I finally won by removing the front wheel at the price of a major setback early in the race. The race now a time trial off the back, I was able to avoid being lapped, which I will consider a moral victory if nothing else. Mechanical issues continued, with a pre-race brake malfunction that rendered my A bike unsafe for travel on a cross course. The first weekend in November brought us the duo of the Schoolyard CX race as well as Feedback Cup. Schoolyard was put on by Nick’s Boulder Junior Cycling team, plus Carl needed to attend some meetings in the afternoon, so the Boni’s skipped racing and volunteered instead. It was actually a lot of fun, and far more relaxing not having to worry about race prep throughout the day! The race was held at the Boulder Res, with lots of long straightaways and plenty of sand. I was excited to return to the Boulder Res, where I had my best result of the season back at the CO CX Classic. Today's course was similar to that, but with a lot more beach in play. Ordinarily I'm clueless on the sand, but something clicked today, and I was able to stay on the bike and ride the entire beach and pit every time but once. I managed another good start, improving from the fourth row to somewhere near the top 10. I made a couple mistakes in the first grassy/twisty sections, and lost a few spots, but gained them back in the power sections. That was pretty much how the whole race went, trading spots with the same group of guys depending on the terrain. I snuck into the top 20 for the first time this season, finishing in 18th, very happy with my effort and the result! Sunday’s Feedback Cup race saw our whole team participate! It was fun having everyone there. The course was the traditional one at the juvenile center in Golden with dirt singletrack limiting passing options and lots of loose, twisty turns. This was the first race on the ‘short’ schedule so Carl and Rob led us out at 10am. Their field was large and strong, with 45 riders and all the top guns. The search for my legs continues. As you may remember, at the last race at this venue, I was struggling with the loose turns. This time I was comfortable on those, but just couldn’t put out any power—fatigue from a stressful week? Dehydration? No idea, but need to figure it out. I feel like I still haven’t found my form this year. I’m 10-15 spots back from where I was last season. In Sept and Oct, everyone just said ‘well, it’s still early’, but we’re halfway through the season now, so if I don’t come around soon it’ll be too late. It’s a struggle sticking with our training methods that have always worked in the past, resisting the urge to chuck it and try something completely different and untested. I’m trying not to push the panic button or just give up and pull the plug. Tired of finishing races frustrated with my performance! Thanks for listening to my rant. Last weekend brought the return to a well worn course in Golden, basically a short track MTB style course; not my favorite, but a good skills session. The weather was great again, at least from my standpoint, and I was finally able to ride my A bike the entire race without incident. After the relentless turns on Sunday in Golden, I am looking forward to the Interlocken course this Saturday, which has some relatively long straight sections that are a better match for my skill set. 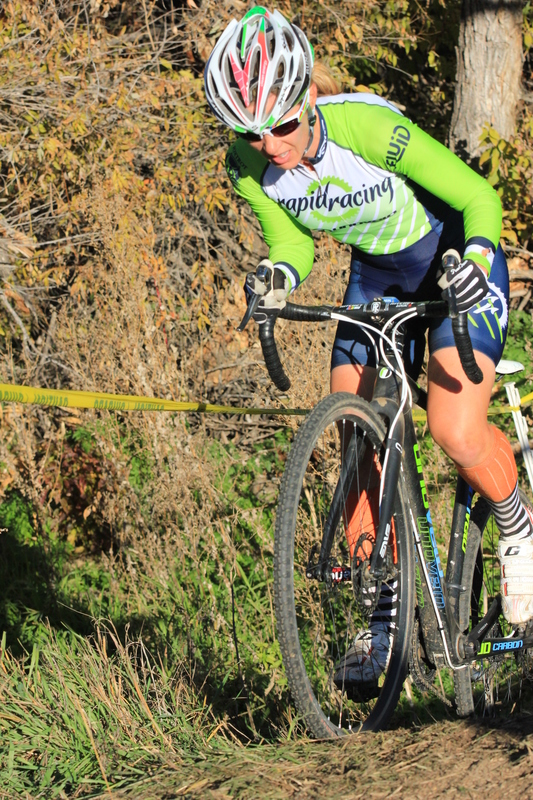 Errin rolled out next in another large SW4 field—looks like future growth in Colorado women’s cycling is safe! She rode to a solid 11th place. I arrived at the course Sunday tired from yesterday, and fighting off a head cold, so I wasn't expecting great things. This definitely wasn't my kind of course...very twisty, and not a lot of extended pedaling/power sections. Too much on-and-off the gas for me! Throw in the lack of call ups, which landed me near the back of the biggest field I've raced in so far this season, and things weren't starting well. I manage to improve my position on the start, and after a lap, my legs woke up. I steadily picked off riders, improving to mid-pack. I made one big mistake on the third lap, washing out my front wheel on a tight turn. The bike took the worst of the fall, and it took me about a minute (and 10 - 12 places) to get the handlebars pointing reasonably straight and get back pedaling. I spent about half a lap getting some confidence back, and the last lap picking off three or four more places to finish in 41st. Given how I felt before the race, it wasn't a terrible result, but if I could've kept it upright in that one turn, I think a top 30 finish was definitely possible. Finally Kristal lined up for the SW Open. All the top ladies were there, so we knew it would be a good gunfight. It was a fun race to watch, with lead changes and solid, skilled riding. Kristal rode well to come across the line in 8th place. This coming weekend will see 2 classic power courses—Saturday is the lush grass of Interlocken, one of Rob’s favorite courses, to quote him “for reasons I have never understood”. Sunday will be a Gold level Cross Cup race at Xilinx with the Blue Sky Cup race, which is sure to bring everyone out! November 14, 2013 by Kristal Boni.